By this time, several civilizations had established themselves across the known world: from Sumer in Lower Mesopotamia over the entire Fertile Crescent, across Canaan and down to Egypt, but also across Turkey into Greece and in the Aegean Sea with the Minoan islands. Further east, people had settled in the Hindus Valley and until the last shores of China. One of the early kingdom was Akkad which became prominent at the time of Sargon (of Akkad). 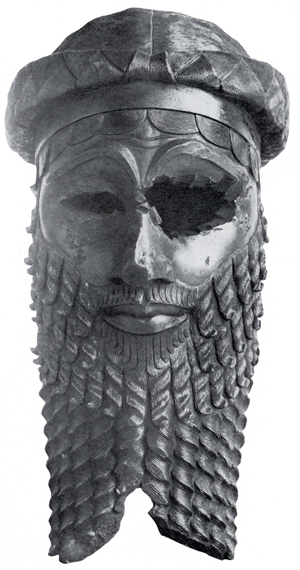 The name Sargon is actually Sarru-kinu, which means the true king. One of his grandsons, Naram-sin, also ruled Akkad and conquered the Near-East kingdom of Ebla (present-day Tell-Mardikh in Northern Syria). When he took this important city, he erected a victory stele boasting that never since the creation of man had any king (before him) conquered Ebla ! On this stele, Naram-sin is depicted like a giant, compared to his troops and his enemies, maybe as a proof of the existence of a race of giants (the Anakim) who are mentioned in the Bible as sons of the "fallen angels" (the Nephilim) and men of renown. The land which was at the west of the Euphrates was called Mar-tu in Sumerian texts. This name roughy encompassed the people who lived in Northern Syria until the Mediterranean Sea. The name later became Amuru in Mesopotamian texts and this is confirmed by the Bible which names them the Amorites. Chant to him the holy song, the incantation sung in its chambers -- the incantation of Nudimmud: "On that day when there is no snake, when there is no scorpion, when there is no hyena, when there is no lion, when there is neither dog nor wolf, when there is thus neither fear nor trembling, man has no rival! At such a time, may the lands of Šubur and Ḫamazi, the many-tongued, and Sumer, the great mountain of the me of magnificence, and Akkad, the land possessing all that is befitting, and the Mar-tu land, resting in security -- the whole universe, the well-guarded people -- may they all address Enlil together in a single language! The king sent me 5 times to crush the land of the Heru-sa and suppress these revolts with this army. [...] I went again with these troops, on ships, and crushed this land even until the remote locations [or marshes] of this region, north from the land of the Heru-sa. The name 'Heru-sa' has been understood as the "Sand-Dwellers", although its meaning is closer to the "Lords of the Sands". It makes sense because most of the region of the Levant, until the Galilee, was covered either by sand (the Negev region and the southern coast) or marshes (the Sharon region). Tomb of Weni - "Land of the Sand Dwellers"
And Noah was 500-year old and Noah begot Shem, Cham and Yafeth. It is the second instance of the Biblical text where the birth of three sons from one individual is mentioned. The previous occurrence was with Adam who begot Cain, Abel and Seth, at different times. Abel died and his life was therefore wasted. Cain turned to evil, and brought wickedness on earth. Seth was the worthy one who survived, and he had multiple sons and daughters, from which only one lineage stayed in the path of God. Similarly, with Noah’s sons: Cham will choose a sinful path; Yafeth, despite his pleasant physical looks (his name means beauty), will bring evil kingdoms and wars; and Shem will give birth to multiple people from which a small portion would eventually continue in the path of God. And the Earth corrupted itself in front of God and the earth was filled with violence. God saw the Earth and, behold, it was corrupted because it corrupted every flesh from its path on earth. Mankind ruined the earth and all the creatures that God created. In fact, there was no more mankind as the boundaries between man and beast became so blur that God had recourse to mention them as every flesh. Looking at the two verses above from the Bible, in the first instance the Earth corrupted itself (תִּשָּׁחֵת הָאָרֶץ) and then it became irreversibly corrupted (הָאָרֶץ... נִשְׁחָתָה) and finally it corrupted (הִשְׁחִית) every flesh on Earth. This three times mention of the same verb indicates that the corruption was total, complete, because this is the meaning of the number three. And God said: "Let the Earth sprout vegetation, herbage producing seed, and fruit-tree making fruit according to its kind, containing its own seed, upon the Earth.' And it was so. And the Earth sprouted vegetation, herbage producing seed according to its kind, and tree making fruit, containing its own seed, according to its kind; and God saw that it was good. Where did the Earth deviate from God's order? A careful comparison of the two above verses shows that, for example, God ordered that the trees would be fruit-trees themselves, meaning that the tree itself would be a fruit, and not simply a producer of fruit. Man would have been able to eat the fruit and the tree, if the Creation had been according to the divine plan. But the Earth, at a time when some free will existed in all elements of the Creation, diverted from God's will. Although the result was nonetheless pleasing as God saw it was good, it nonetheless represented a corruption from God's will, and the start of sin. The parallel between the Earth's corrupted way during the Creation and the corruption that continued later can also be understood in the number of these verses: Genesis 1:11-12 for one and Genesis 6:11-12 for the other. God's punishment would not be directed at mankind only but at the entire Earth and what it contained. God would have to correct the ways His Creation was going, and stripped some of the original benefits from it so that the corruption of the created world would become harder, if not impossible, to achieve by itself. Copyright � Albert Benhamou 2013 - All rights reserved.